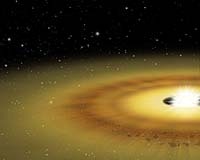 Their observations, of the disk surrounding Beta Pictoris - and produced by the 8.2 meter Subaru Telescope on Mauna Kea, Hawaii - suggest it contains asteroid and comet-like objects that are colliding, much in the same way as the solar system containing Earth and the other planets formed some 4.5 billion years ago. The Japanese team - including astronomers at the National Astronomical Observatory of Japan, Nagoya University and Hokkaido University - combined the technologies for the first time to obtain infrared polarization images of the Beta Pictoris disk with better resolution and higher contrast than ever before. They used the Subaru’s large-aperture telescope, adaptive optics and coronagraphic imager, which is capable of analyzing light in different polarizations. A large-aperture telescope, particularly one like the Subaru with its great imaging quality, allows faint light to be seen at high resolution. Adaptive optics reduces the atmospheric distortion of light, also allowing higher resolution observations. Coronagraphy blocks light from a bright object such as a star, so astronomers can view the fainter objects near it, such as planets and dust. By observing polarized light, they can distinguish reflected light from direct starlight. Polarization also produces information about the size, shape and alignment of dust reflecting light. Polarization of the light reflected from the Beta Pictoris disk in two-micrometer-wavelength light shows the long thin structure of the disk seen nearly edge on. Using these combined methods, the team observed Beta Pictoris in infrared light at a wavelength of two micrometers and at a resolution of one-fifth of an arc-second - a resolution equivalent of being able to see an individual grain of rice from one mile away or a mustard seed from a kilometer away. Reporting in the April 20 issue of the Astrophysical Journal, the team said the dust in Beta Pic's disk is more than 10 times larger than typical grains of interstellar dust. The material probably is made of micrometer-sized loose clumps of dust and ice resembling minuscule bacteria-size dust bunnies. They said the data strongly suggest the disk surrounding Beta Pic - as it is commonly known - contains planetesimals: asteroid or comet-like objects that collide to generate dust that reflects starlight. Beta Pic is the second brightest star in the constellation Pictor, or the Painter's Easel, and is a very close neighbor of the Sun, only 60 light-years away, which makes it easy to study in detail. Beta Pic is twice as bright as the Sun, but the light from the disk is much fainter. Astronomers first detected this faint light via coronagrphy in 1984. Since then, many astronomers have observed the Beta Pic disk using ever better instruments and ground and space-based telescopes to study the process of planetary evolution. "Few people have been able to study the birth place of planets by observing polarized light with a large telescope," said team leader Motohide Tamura. "Our results show that this is a very rewarding approach. We plan on extending our research to other disks, to get a comprehensive picture of how dust transforms into planets." ESA scientists using data from the now-inoperative Infrared Space Observatory have captured the first look at the birth of monstrous stars that shine 100,000 times more brightly than the Sun. The discovery could reveal why only some regions of space seem to promote the growth of these massive stars.